Giveaways will be a little different around here now. They will be posted when they come and will mostly be with only one artist/healer to highlight their work and offerings. I am really excited how this will unfold throughout the year. If you have any soulful offerings, art. jewelry, e-courses, anything you think will fit Moondaughter - I want to hear from you! Please email me at marissa.moondaughter@gmail.com so we can work together! 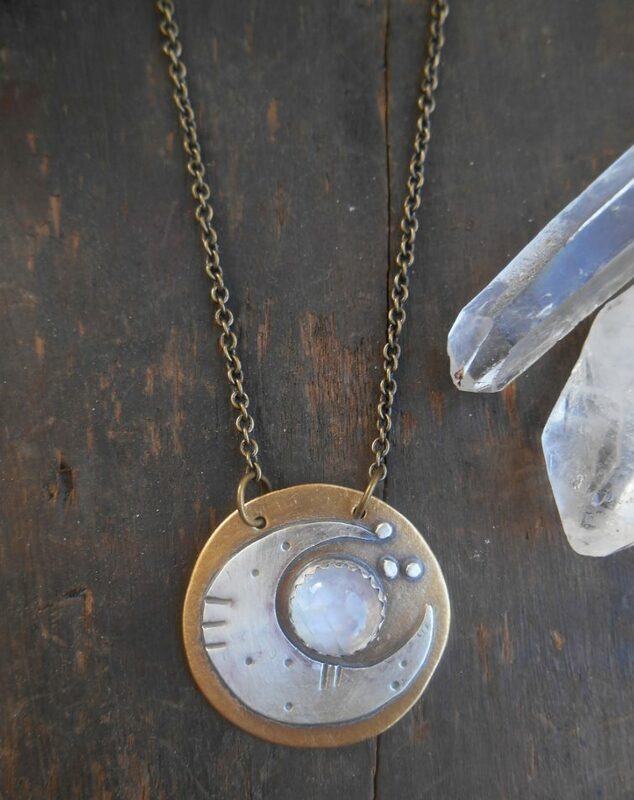 And now, today's giveaway will be featuring a beautiful moon pendant from Katie with Star Native! When did you begin to make your gorgeous jewelry? I took my first class in 2000 when I finished college and fell in love with metal-smithing. But after that I got my first post college job and worked as a graphic designer for about 6 years. I began to miss art school and the feeling it gave me where I was constantly exploring my creative side. I desperately missed having my own creative expression so I quit my full time job to freelance so I could have more of a balance between work and my own personal creative expression. I took some different classes, guitar, pottery and metalsmithing. During that time, my love for metalsmithing was renewed and I slowly over time bought the equipment to have my own studio at home. I'm back working full time again but I am still able to go to my jewelry studio to get that feeling of playing with my creative side that I was missing for so long. What is your inspiration? How do you find it again and again? I always find this question hard to answer! I'm inspired by the same things a lot of other people are such as nature, the sky, old vintage things, other designers and primitive jewelry. But there is this thing in me that just makes the designs happen and I can't really describe it. A lot of times I just get visions that pop in my head out of nowhere and it is a finished design and then I have to sketch it so I don't forget and then eventually go and make that piece of jewelry that came to my mind. A lot of times, the designs that come to my mind, I don't yet have the skill set or equipment to make them a reality but hopefully someday! I find that the more I can have quiet time and meditate, the ideas and visions come a lot easier. It happens often when I'm falling asleep too so I keep a little sketch book and pen by my bed. When I don't have visions just pop in my head like I just described, a lot of times I take a stone or crystal, outline it on my sketch pad and then draw designs around it. I just keep drawing until I come up with the design I like the best and then create that. Most of the time I feel like I am experimenting and seeing what I'm capable of. Sometimes it works out and other times, not so much. A lot of my prototypes that don't seem quite right yet end up being what I keep for myself. I don't mind all the imperfections and "mistakes" at all but I feel like things need to be more perfect for my Etsy shop. I would love for this to be how I make my living one day but I always get scared that it will be overwhelming or I won't love making jewelry because it's now my "job". I think maybe a little freelance graphic design thrown in there will keep things more balanced for me to do that. I always had a little dream of having some of my designs sold on Free People or Bona Drag's website and I would like to get my work into some boutiques as well. I can't tell exactly where I am going right now but I feel like it is more of a possibility for my dreams to come true and I'm really excited about that! 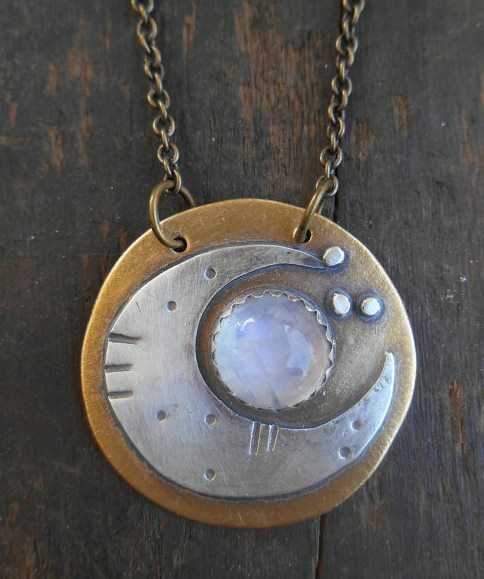 How do you incorporate the Moon into your daily life? Thank you so much Katie for your beautiful offering! Enter in the Widget below and the lucky winner will be announced of Valentine's day, aka the Full Moon!